This Chicken Bacon Ranch Pasta tastes so unbelievably good, it’ll be hard to believe that each serving is just 6 Points. I mean, come on….look at the title of the dish…Chicken. Bacon. Ranch. Pasta. What’s not love here?!? 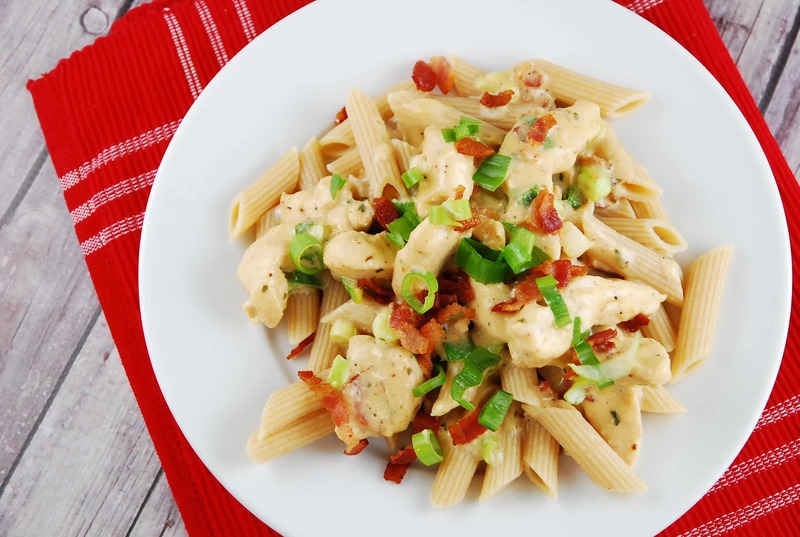 The creamy, ranch flavored cheese sauce brings together the flavors of the crisp, salty bacon and the juicy chicken breast, which is sautéed in a bit of bacon drippings. DELICIOUS, I tell you! Yes, this dish “costs” a bit more than I’d like at 6 Points for a 1 cup serving, but it is so heavenly, I feel like I’m being bad, and, well, that makes me feel pretty good. :) Increase your serving size, if you’d like, and make this a 4 serving recipe and then each serving would be 9 Points. If you pair this Weight Watchers pasta recipe with some 0 Points roasted veggies and a very light salad, then this would be an amazing, guilt free meal! Cook bacon in a large skillet until crisp, then drain on paper towels. Chop bacon when cool enough to handle. Drain most of the bacon drippings from the pan, leaving about 1 tbsp. Return pan to medium hit heat. Season chicken with salt and pepper, and add into the skillet with bacon drippings, and cook until no longer pink and becomes golden brown, about 4-6 minutes. Add in milk and ranch dressing packet, and stir well. Cook until thick and bubbling. Add in cheddar cheese and 1/2 of the reserved bacon. Cook, stirring regularly until cheese is melted. If sauce becomes too thick, thin it out with some fat free chicken broth as needed. Spoon sauce over pasta, and sere with remaining bacon and green onions sprinkled on top. Made this recipe tonight. Got a thumbs up from the whole family…..will definitely make again. We made this last night for dinner && it was amazing! when you say a cup how much is it in grams or oz cuz i live in Norway and we don’t use cup as in the US. Chicken and bacon pasta, one of my fav’s, Thanks for sharing the recipe. I would recommend cutting the ranch packet by half. It was a bit too salty for my taste. Other than that it was good! Thanks! Hi, this looks yummo but my issue is I live in Australia and we do t have ranch mix is there anything I could use instead? You can use a blend of the following spices: garlic powder, onion powder, dried parsley, dried dill weed, dried minced onion, and salt, pepper. This is awesome. I gave my pup a couple of pieces of the chicken, and he agrees that it’s very good. I will definitely make it again. I chose all the same as you and my calorie count was nearly 100 more per serving. What tool are you using to calculate? I chose 8oz. Penne, 1/2 cup of cheese & 100 grams of green onion. Divided by four, I get 328 per serving. What am I doing wrong or different from you? Help. The recipe is actually 6 servings, not 4….it’s my fault….I made a typo and posted 4 servings at the bottom of the recipe, but then calculated it (and mentioned it in my intro) as 6 servings. So sorry for the confusion! I made this last night for dinner. It was fast and fabulous! Both my husband and I loved it! It states 4 servings and then 6 servings – which is it? Thanks. Looks delicious! I want to try this tonight it looks so delicious! However, I just want to confirm that 1 cup is 6PP?? Because one part above states it yields 6, and another place states that the entire recipe makes 4 servings. I’m not that concerned how many servings, but I just want to be sure that 1 cup is 6PP.